With cooler temperatures and shorter days, fall is in the air in the Pacific Northwest. This has many Portland homeowners thinking about the holidays and what kind of tasty treats they will whip up for friends and family. There is nothing worse than sifting through your baking goods only to discover that pantry pests have invaded your kitchen, eating their way through spices, flour, and other baking necessities. Today, the trusted exterminators at PestLock will review a few tips that can help you protect your kitchen from an untimely infestation this holiday season. After you’ve read the information below, contact our team to request your free pest inspection! Drugstore beetles. These pests measure about 1/10 of an inch long, have elongated bodies, and reddish brown in color. Cigarette beetles. This species is about ⅛ of an inch long, are oval-shaped, and are yellowish- to reddish-brown in color. Indian meal moths. At nearly ½ an inch long, these pests have distinctive wing markings, and their larvae are generally beige with shades of yellow, pink, brown, or green depending upon their food source. If you find any stored product pests in your pantry, throw out the affected food right away. Be sure to discard it in an outdoor trash receptacle that has a tight-fitting lid and thoroughly clean the area where the pests were located. Calling a reputable pest control company, like PestLock, can help ensure the pests are gone for good. Now that you know what to look for, let’s review how you can keep these troublesome insects out of your kitchen. The best way to avoid any type of pest infestation in your home is to eliminate the food source that the insects are attracted to. This doesn’t mean that you have to clean out your pantry. However, the dry goods that you store in your pantry should be kept in airtight containers. As long as they have a tight-fitting lid, the containers can be made from glass or plastic. Not only will this keep unwanted stored product pests out of your food, but it will also help keep rodents at bay. In addition to food, pantry pests may be attracted to certain types of seasonal decor. If you use dried leaves, Indian corn, or potpourri in your fall decor, take care to store these items properly. It is best if these items are stored in airtight containers while not being used, and you may want to unpack them outside so that you can inspect them closely before bringing them in. 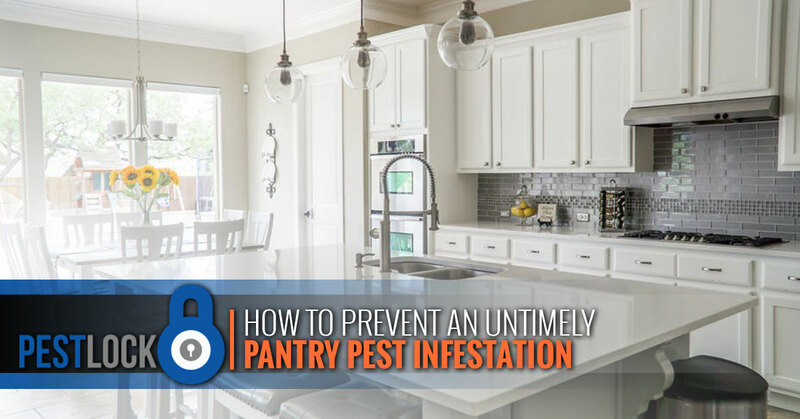 The last thing you want is to introduce pantry pests into your home by bringing in infested decor. 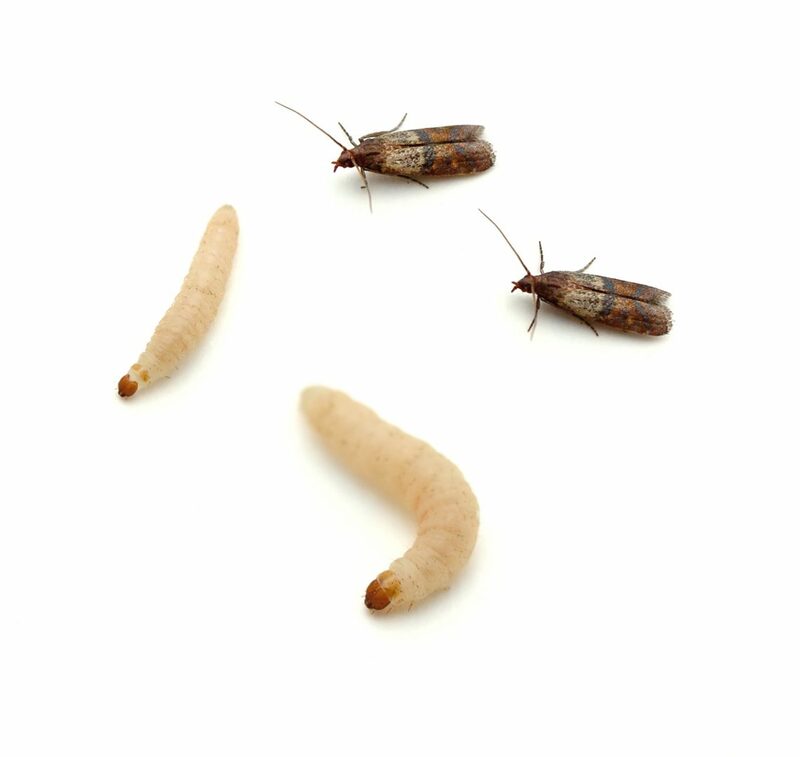 One of the most common ways that stored pantry pests are introduced into a home is by bringing them in via an infested product from the grocery store. The next time you are grocery shopping, be sure to closely examine the packaging of your food selections before throwing them into the shopping cart. If any of the packages are torn, ripped, or otherwise damaged, choose a different one. In addition to inspecting your groceries and storing food properly, practicing good sanitation can also help keep pantry pests out of your kitchen. If you notice that some flour, birdseed, yeast, or another product has spilled in your pantry, clean it up right away so as not to attract pests. Additionally, it is a good idea to clean out your pantry on a regular basis, inspecting food as you go and wiping down the shelves with warm soapy water to remove food residues. By their nature, stored product pests are very small, which makes it very easy for them to get into your home. By looking in the right places, however, you can discover potential entry points. Pantry pests love moisture, and they will often enter a kitchen through tiny cracks and gaps surrounding plumbing. They may also enter near stovepipes, and sealing these crevices can help prevent further infestation. Request a Free Pest Inspection in Portland Today! Are you worried that you might have a pantry pest infestation in your Portland home, or are you hoping to find assurance that your stored goods are pest-free? If so, the exterminators at PestLock are here to help. We’ll perform an inspection of your pantry and kitchen to determine if there is any indication of an infestation. If there is, we will discuss possible treatment options with you that will lock stored product pests out of your home for good. To request your free pest inspection, contact our team today at 503-342-8303 or contact us online!